Gnocchi really comes into its own when floury potatoes such as Desirée are in season. 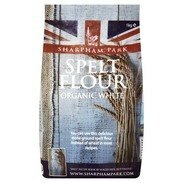 The quantity of flour given here is fine for autumn and winter but in Spring and Summer, when potatoes are denser with liquid, you might need to add 300g/10 ½ oz/2 ½ cups (or even more) flour to make the dough. The gnocchi will store in an airtight jar in the fridge for up to two weeks. Preheat the oven to 180°C/350°F/Gas 4 and and lightly flour a baking sheet. Pierce the potatoes several times with a fork. Put them on the sheet and roast for 45 minutes, or until soft and cooked through. Meanwhile, make the pesto. Put the walnuts and garlic in a food processor and process until finely chopped but still with some texture, so don't over-process. Add the Parmesan and basil and process again. With the motor running, gradually add the oil until the mixture is thick. Season with lemon juice, salt and pepper. Leave to one side. Remove the potatoes from the oven and, using plastic gloves, quickly remove the potato skins. They can be kept for a snack or discarded. Put three-quarters of the flour on the work surface and season with the salt. Push the hot potatoes through a potato ricer, or mash them thoroughly, and put on the work surface. Gradually knead the potato into the flour until you have a smooth mixture that isn't too dry. If you find it difficult to bring the dough together, gradually add a little beaten egg to the mixture to help bind the ingredients together, or add more flour, as necessary. Shape the dough into 2 long sausages about 2.5cm/1in thick and dust them lightly with flour as you go along. Using a sharp knife, slice them into 1.5cm/½in discs, then press them with your thumb into the tines of the fork so they get that characteristic gnocchi shape. Set the gnocchi aside on the prepared baking sheet. Bring a large saucepan of salted water to the boil over a high heat, add the gnocchi and boil until they rise to the top. Count to 10, then drain. 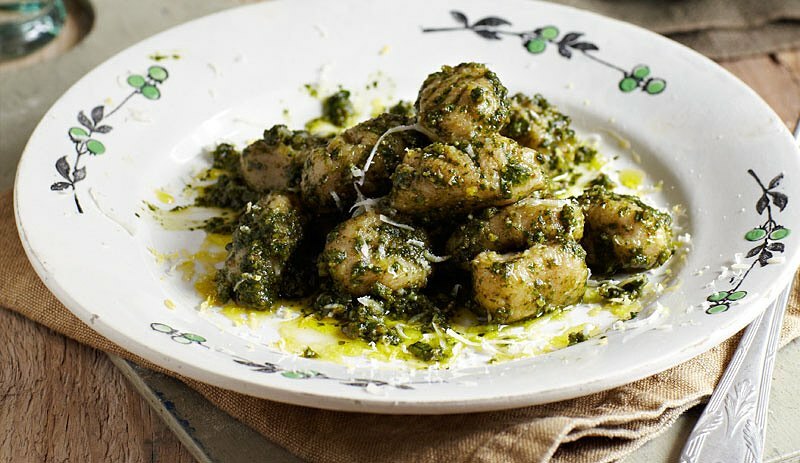 Toss with the walnut pesto and sprinkle with extra Parmesan to serve.